(March 18, 2015 – San Jose, California) At the conclusion of the reception that marked the end of his visit to Stanford University, His Holiness the Karmapa shifted his attention to Buddhist communities. In his first visit to a Dharma center on this long trip, he traveled to San Jose where he was joyfully received by the Dharma friends of Palpung Longtok Choling. Although this Karma Kagyu dharma center is located physically far from the ancestral homeland of its lineage, the resident lamas and students had prepared a traditional Tibetan Buddhist welcome, well adapted to its northern California setting. The auspicious signs had been drawn on the road with the familiar colored chalk used by American schoolchildren to draw on their own sidewalks. 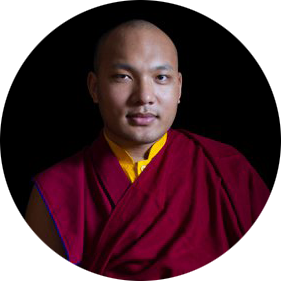 The sound of gyalings—unusual for this suburban neighborhood—was muted, yet gently filled the air as the 17th Karmapa descended from his vehicle and entered the large building that is home to this Dharma community. Entering the vast assembly hall, His Holiness first made offerings at the altar and proceeded to ascend the high golden throne readied for his presence. After opening prayers, tea-and-rice offerings and the formal mandala procession, center founder and director Stanley Wang delivered a welcome speech. He described the gift for His Holiness that center members had designed and made themselves by hand. The gift featured a large silicone wafer, a token of the location of the center in California’s Silicon Valley, as well as the word “love” in large letters. His Holiness the Karmapa himself then addressed the gathering. He observed how few Dharma centers in the United States enjoy the same fullness of ritual objects, with a large central image and a thousand Buddha statues in elegant niches along the wall. He expressed his appreciation and urged those present to recognize how fortunate they were in that regard. He then delivered a brief Dharma discourse. 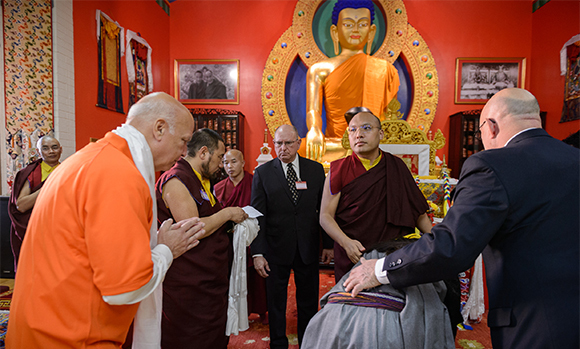 “In the context of the Dagpo Kagyu lineage in general and very much so in the Karma Kagyu,” His Holiness told them, “faith and devotion have a special role to play. It is known as the lineage of devotion. It is likewise the lineage of blessings. Stressing the crucial importance of undertaking every effort to ensure that the sacred bond with their lama remains pure and strong, His Holiness the Karmapa then directed his comments to the relationship among the members of the practice community. “Similarly, it is also important to keep pure the relationships among the members of the Dharma center,” he added. His Holiness the Karmapa then descended the throne to stand facing the altar, surrounded by the Palpung lamas and gathered sangha, and performed a consecration ceremony. Before departing for San Francisco—the next stop on this extended Dharma journey around the country—His Holiness conferred individual blessings on each and every member of this San Jose practice community.